Dad's Christmas Slippers | Oh Sarah O ! My dad has been a very good dad this year. He's been staying busy making home improvements, painting houses, and actively looking for work (is anyone looking for an accountant?). Although my dad has been home more often than he's ever been, it's been nice seeing my dad at my parent's house since I started working in my hometown this year. I know that I always have a place close to work where I can stop and get a hot meal or take a nap before I make the 40 minute drive home. And if I call ahead, dad will even have a pot of hot coffee waiting for me. 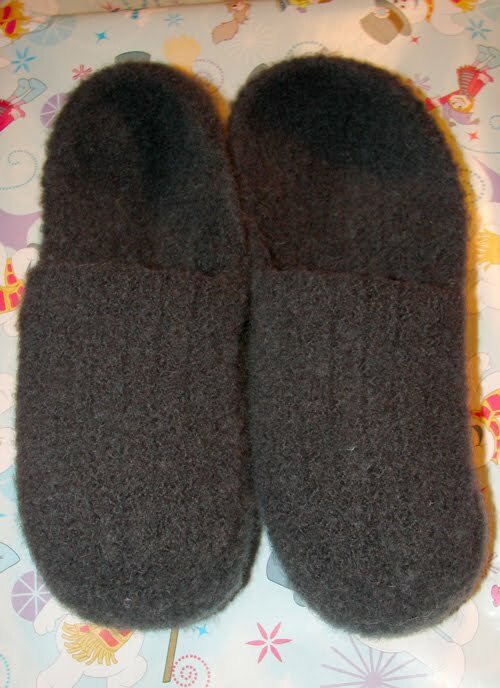 My dad also asked for a pair of felted slippers for Christmas. He said that when he was younger (like WAY back in the 70s) he'd owned a pair of gray felted slippers and he'd liked them so much, he'd worn them until they fell apart. So he wanted me to re-create them. For dad's slippers I used 2 skeins of Patons Classic Wool in dark gray from Michaels, a J hook, and the felted men's slip-ons pattern (found here on ravelry and here). Like mom's slippers, after I had crocheted the slippers, I washed the slippers in the washing machine 3 times on hot in order to felt the slippers.